If you are evaluating web vulnerability scanners for the first time, or struggling to get the best out of Tenable Network Security products, here is why you should consider Acunetix instead. Tenable Nessus, and similar competitors like Rapid7 Nexpose, QualysGuard, and OpenVAS, focus on network vulnerability scanning. They excel at mapping out IP addresses, identifying network services running, and finding unpatched network devices. However, reliable web application vulnerability assessment requires a tool built specifically for that purpose. As web technologies evolve and change, you need a tool designed specifically to crawl web applications accurately, identify all resources and inputs, and detect the full spectrum of web vulnerabilities. You need a tool you can depend on to do that now, and in the future. A network security scanner like Tenable Nessus will have a few web plugins, but it lacks the deep web application analysis engine of a dedicated web application vulnerability scanner. Acunetix Vulnerability Scanner, on the other hand, is designed specifically to crawl out web applications and identify web vulnerabilities. Its DeepScan engine ensures that whether your business depends on traditional server-side applications or modern Single Page Applications, the scanner will detect all of the inputs and functionality. 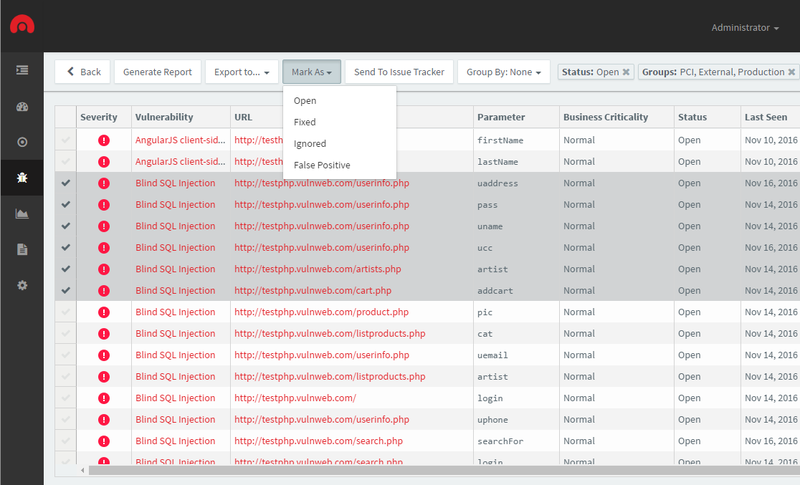 Acunetix detects real web security threats that real-world attackers are searching for, including SQL Injection, cross-site scripting, local and remote file inclusion, weak passwords, and more. These vulnerabilities put your employees’, customers’, and clients’ sensitive data at risk; to retain their trust, you need a vulnerability assessment tool that helps you find and fix these security threats before attackers do. Regardless of your infrastructure, you will find a version of Acunetix that fits your needs. You can run Acunetix on your own infrastructure, on either Windows or Linux. Both versions give you our trademark speed and accuracy. For businesses who need to scan large volumes of web applications on-premises, Acunetix provides a Multi-engine option allowing you to set up several instances of Acunetix controlled from a central console. For teams that prefer cloud security solutions, Acunetix Online gives you all the key features of our web application vulnerability scanner from a secure cloud portal. Your team needs to streamline its web application vulnerability management processes. It matters now, and will matter even more as your business expands its web footprint. Acunetix is more than just a security scanner: you can configure web application scans, schedule them, review the results, and plan remediation through a secure portal. It gives you the advantage of full-featured vulnerability management software, giving you the ability to define web application vulnerability scans, run them, produce vulnerability reports, and track security posture over time — all in one place.